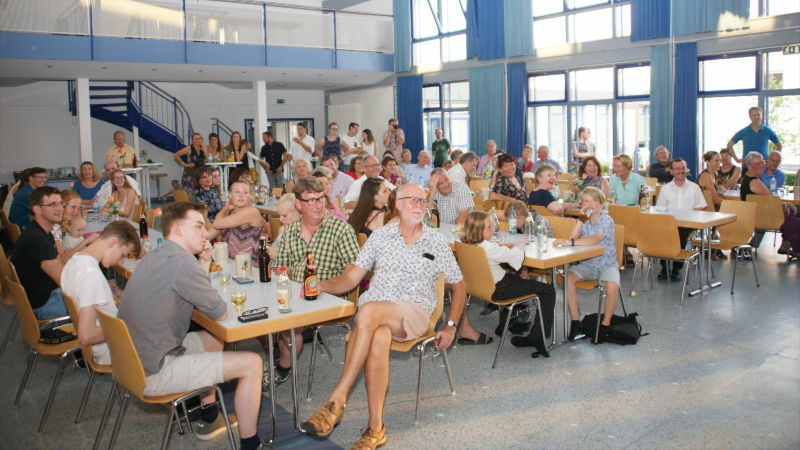 37 people from St Nicholas’, past and present, aged 4 to 80, travelled by plane, train or car to Stegaurach in Southern Germany where we received a wonderfully warm welcome from our partner parish, the Immaculate Conception of Mary. Old friendships were renewed and new ones made. Several people were visiting for the first time and thus able to experience for themselves the warmth and depth of the friendship between our two parishes. Once again we were overwhelmed by our hosts’ generosity and ingenious ways of finding something new for us. We were treated to a very varied programme including a medieval fair, trips to Bamberg, the beautiful hill-top chapel of Veitsberg, a treetop walk in the Steiger Forest, a fabulous open air museum (twice the size of the Weald and Downland!) fun sports, swimming , picnics, beer cellars, winetasting, BBQs, a farewell party and the inevitable white sausage breakfast! And of course, worshipping together was as special as ever – we even boosted the Stegaurach choir with 6 recruits from Arundel! Fr Walter and his parishioners send love and warm wishes to the congregations of St Nicholas’ and the Cathedral and look forward to seeing us all again before long.